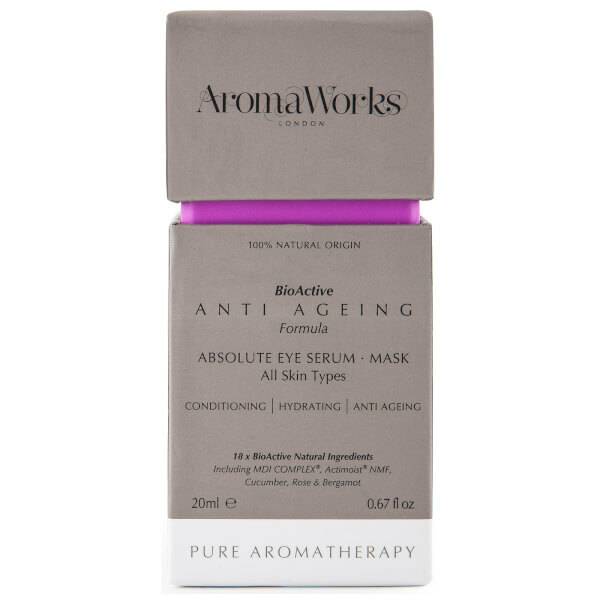 Hydrate and care for skin with AromaWorks Absolute Eye Serum for Men, an anti-ageing formula that works to moisturise and protect the delicate eye area. Infused with 18 BioActive ingredients including an MDI Complex and essential oils, the serum targets dark circles, spider veins and wrinkles to leave sensitive eye skin looking brighter, energised and conditioned. Infused with a fragrance powered by Bergamot and Frankincense. Apply daily to the eye area to rejuvenate the skin before using day or night vream. For a deeper treatment can be used as an eye mask and left to absorb overnight. Aqua, Glycerin, Citrullus Vulgaris (Watermelon) Fruit Extract, Pyridoxine Cylic Phosphate, Sodium, Pca, Anastatica Hierochuntica Extract, Sodium Hyaluronate, Glasminoglycans, Leuconostoc/Radish Root Ferment Filtrate, Arnica Montanta Flower Extract, Acanthopanax Senticosus (Eluthero) Root Extract, Condrus Crispus Powder, Cucumis Sativus Fruit Extract, Potassium Sorbate, Equisetum Arvense Extract Glasminoglycans, Peptapeptide-34 Trifluoroacetate, Xanthum Gum, Rosa Centifolia Flower Oil, Bosweillia Carteri (Frankincense) Oil, Daucus Carota Sativa (Carrot) Seed Oil, Jasminum Officinale (Jasmine) Oil, Citrus Aurantium (Neroli) Oil, Bergamot (Citrus Bergamia) Fruit Oil, Angustisfolium Flower Oil, Limonene, Gernaniol, Citronellol, Linalool.